More than 200 people packed into the Weigh Inn hotel in Thurso this week as Dounreay Site Restoration Limited and supply chain partners shared plans and ideas about the decommissioning of the site. Leading nuclear firms mixed with numerous small and medium sized enterprises for the event which was attended by those who either support the site through existing framework contracts or have registered for the innovative ‘LINC with Dounreay' scheme. Smugglers Inn - Ackergill Tower's New Onsite Pub - Opening Soon! Ackergill Tower is delighted to announce a new addition to the Ackergill Tower Estate, ‘Smugglers Inn', their very own onsite pub! Opening on 30th March from Fridays to Sundays, the traditional Scottish pub is full of charm and ideal for lazy lunches or afternoons by a log fire; with a mixture of seating areas available and low level lighting, it is the perfect place to sit back and relax. With a fully stocked bar, serving local favourites including Northern Light Ale and Orkney and Pulteney Whiskies, they'll be on hand to serve drinks between 12pm-3pm and 5pm-midnight. 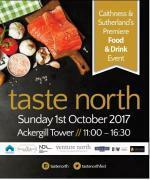 Taste North, the north Highland's premier food, drink and craft event, in association with Venture North and the Nuclear Decommissioning Authority (NDA), are back for the third year running and this year return to Ackergill Tower with a packed line up and a leading name in the culinary world to head up the fantastic schedule and inspire the foodie passion in us all! Nick Nairn will be joining us as our very special guest this year at Ackergill Tower on 1st October 2017. Nick Nairn is synonymous with spreading the word about Scotland's wonderful natural larder and using it well and couldn't be better placed to highlight the phenomenal produce on the door step of Caithness & Sutherland. Wedding venue specialist, AmaZing Venues is celebrating its latest win at the Scottish Wedding Awards 2015 where Ackergill Tower was awarded Wedding Venue of the Year North East. Now in its third year, The Scottish Wedding Awards is very much a celebration of local businesses.